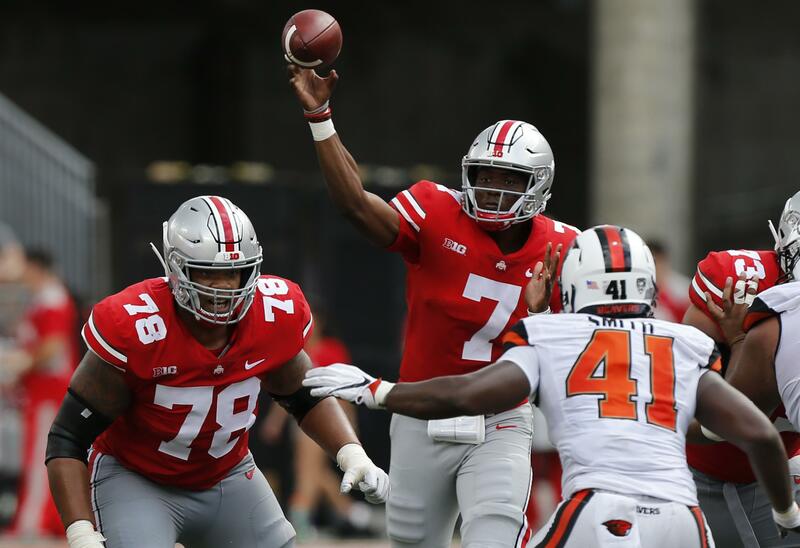 With coach Urban Meyer serving a suspension, new starting quarterback Dwayne Haskins Jr. had a record-setting day, throwing five touchdown passes to help Ohio State rout Oregon State 77-31 in the opener for both teams in Columbus, Ohio, on Saturday. (15) USC 43, UNLV 21: JT Daniels, the second freshman to start at quarterback in a season opener for Southern California, threw for 282 yards with a 43-yard touchdown pass to Amon-Ra St. Brown to lead the Trojans over the Runnin’ Rebels in Los Angeles. Daniels was 22-of-35 passing for the Trojans, with fellow freshman St. Brown making seven receptions for 98 yards. The former Mater Dei High School teammates connected for their first college touchdown on the first play of the fourth quarter, with St. Brown getting a step behind cornerback Jericho Flowers on a post route to give USC a two-possession lead over the Rebels. (24) Oregon 58, Bowling Green 24: Justin Herbert threw for five touchdowns and ran for another score to lead the Ducks over the Falcons in Eugene. California 24, North Carolina 17: Patrick Laird rushed for one touchdown and caught another, California’s defense took advantage of a rocky outing from North Carolina quarterback Nathan Elliott and the Golden Bears defeated the Tar Heels in Berkeley, California. Cameron Goode scored on a 38-yard interception return but left in the fourth quarter with a possible leg injury. Goode’s interception was one of four by the Golden Bears. Cornerback Jaylinn Hawkins had two. Cincinnati 26, UCLA 17: Michael Warren II rushed for 141 yards and three touchdowns, and the Bearcats spoiled Chip Kelly’s coaching debut by throttling the Bruins in Pasadena, California. Cortez Broughton forced a fumble that led to a tiebreaking safety with 9:45 to play, and the Bearcats’ defense limited UCLA to 306 yards in the first game of Kelly’s ballyhooed return to collegiate coaching after a six-year absence. Shortly after Broughton stripped UCLA freshman quarterback Dorian Thompson-Robinson and forced Caleb Wilson to fall on it in the end zone, the Bearcats stopped the Bruins on downs at the UCLA 36. Cincinnati then got its only offensive points of the second half with 1:44 to play on Warren’s third 1-yard TD run. Arizona State 49, UTSA 7: Manny Wilkins threw for four touchdowns, two to N’Keal Harry, and the Sun Devils gave new coach Herm Edwards a big night in his return to the sidelines with a rout of the Roadrunners in Tempe, Arizona. Wilkins, entering his third season as Arizona State’s starter, completed 16 of 24 for 237 yards and left the game after three quarters with his team comfortably up 42-0. BYU 28, Arizona 23: No other details were available by press time. Published: Sept. 1, 2018, 9 p.m. Updated: Sept. 1, 2018, 11:32 p.m.